LUSciD coLLaboration: LUSciD collaboration is a joint collaborative effort between Lawrence Livermore National Laboratory (LLNL), University of California and San Diego Supercomputer Center. The objective of the coLLaboration is to apply advanced scientific data management technologies to improve the conduct of large scale science. Most of the these requirements could be categorized as what i call as "rebels and misfits of existing technology". If we analyze the history of computer science (especially data storage) there may be few accidental discoveries. But, most of the new technologies are a result of some requirements that were trying to push the limits of an existing technology. These esoteric requirements were usually from high-end users who wanted "more" in terms of performance, throughput or scalability. The requirements of these high-end users could not be satisfied by the existing technology. From the existing technology’s perspective, these users could be considered as "rebels or misfits of technology" who were pushing the envelope too much and are trying to overthrow the existing technology. LSST Project: The Large Synoptic Survey Telescope (LSST) is a proposed ground-based 8.4-meter, 10 square-degree-field telescope that will provide digital imaging of faint astronomical objects across the entire sky, night after night. The IT part here is to manage Petabytes of data. Nature's Editorial cites this project to be "Steering the future of Computing". We might be storing and managing over 150 Petabytes of digital data. Our work here is two fold (Hardware infrastructure and Software infrastructure). SDSC is the data access center for LSST providing hardware infrastructure (we just worked on estimating its cost). We are also involved in middleware for data management, working on the software for LSST. I started to work on this project voluntarily, based on the request from LLNL. I now take part in the data management and architecture discussions (usually from a data grid perspective). A good group of people to work with. LLNL GDO: This is not a real big project now. But, i hope it will turn out to be something big or useful at LLNL. The task here is to design a data management architecture for data sharing between LLNL and its external partners. Apart from the IT perspective, we need to make sure a pragmatic approach is designed so that users can use the resources without exploiting them. There are several security and access control restrictions that need to be met. All data in GDO are considered to be public or UNCLASSIFIED (so i can mention this project here). I collaborate with Jeff Long from LLNL on this work. SDSC Matrix Project: SDSC Matrix is a Grid Workflow process management system. Matrix provides the protocols and software infrastructure needed by Inter-organizational data management services to create, access and manage grid workflow pipelines. Matrix uses the Data Grid Language, which can be used to describe, query and control process-flow pipelines. Matrix provides the software mechanisms to define and execute long lived datagrid administrative tasks. While data grids like SRB provide logical namespaces to manage unstructured inter-organizational data, Matrix provides mechanisms to provide mappings from logical namespace to process namespace and vice-versa. (e.g) an insert or delete on a logical namespace could trigger a process that has to be operated in the datagrid. Data Grid Management System (DGMS): Each organization in a data grid needs a system composed of services that will enable it to dynamically form or join communities and coordinate the management of inter/intra-organizational data and resources. DGMS is a P2P middleware that provides a logical view of inter/intra-organizational data and resources to its applications. The key difference between the DBMS and DGMS is that whereas the physical organization of resources (storage) is hidden in DBMS, it is provided as another logical view to the applications in DGMS along with data. Grid Applications can use the logical layer of distributed data as they do in DBMS (with out being worried about the physical location of data). In addition they can use the logical view of the shared, distributed and heterogeneous resources in the grid environment. The basic operations (like simple query plan or ingestion of data) in the data grid can use this logical view resources (storage) to decide on which shared physical resources to use. More protocols and more challenges lie ahead for DGMS. Moore, R.W., Jagatheesan, A., Rajasekar, A., Wan, M. and Schroeder, W., “Data Grid Management Systems, ” Proceedings of the 21stIEEE/NASA Conference on Mass Storage Systems and Technologies (MSST), April 13-16, 2004, College Park, Maryland, USA. Helal, A., Wang, M. and Jagatheesan, A., “Service-Centric Brokering in Dynamic E-business Agent Communities,” Journal of Electronic Commerce Research (JECR), Baltzar Science Publishers, 2001. (pdf). Jagatheesan, A., Pinheiro, J. and Sreenivasan, N., "Software Agents for Information Brokerage", Technical Report, Kumaraguru College of Technology’, Coimbatore, India. Subramanium, T. and Jagatheesan, A., "Fuzzy-Logic based controller in Wind Energy Applications", Proceedings of SENSORS’98, Regional Engineering College, Trichy, India. An Introduction to Data Grid Management Systems Tutorial (featuring the Simpsons) at the Sixth International Conference on Web Information Systems Engineering (WISE 2005), November 20 - 22, 2005, New York City, USA. Data Grid Management Systems Tutorial at the Fourth IEEE International Conference on Data Mining (ICDM 2004), November 01 - 04, 2004, Brighton, UK. Data Grid Management Systems Tutorial at the ACM/IFIP/USENIX 5th International Middleware Conference (Middleware 2004), October 18th - 22nd, 2004, Toronto, Ontario, Canada. Data Grid and Gridflow Management Systems Tutorial at the IEEE International Conference on Web Services (ICWS 2004), July 6-9, 2004, San Diego, California, USA. These charts explain about the GFS architecture as was discussed in the GGF. I strongly believe this is feasible and will turn out to be commercially useful in the near future. If you have any questions about this open community standardization effort, i will be glad to provide answers. Data Grids and Workflows Tutorial at the Joint Conference on Digital Libraries (JCDL 2004), June 7-11, 2004, Tucson, Arizona. Data Grid Managemnet Systems (& SRB) Tutorial at the IEEE/NASA Goddard Conference on Mass Storage Systems and Technologies, April 13-16, 2004, College Park, Maryland. Data Grid Management Systems Invited Talk at the Storage Networking World, Spring 2004, April 5-8, 2004, Phoenix, Arizona. Data Grids: Opportunities and Technical Challenges Ahead Invited talk at the Pacific Neighborhood Consortium 2003 (PNC 2003), November 7-9, Bangkok, Thailand. ppt pdf . Grid File System-BoF Introduction to Grid File System Group at the Global Grid Forum, October 7, 2003, Chicago. ppt, Prepared along with the other co-chairs: Osamu Tatebe, AIST and Jane Xu, IBM. 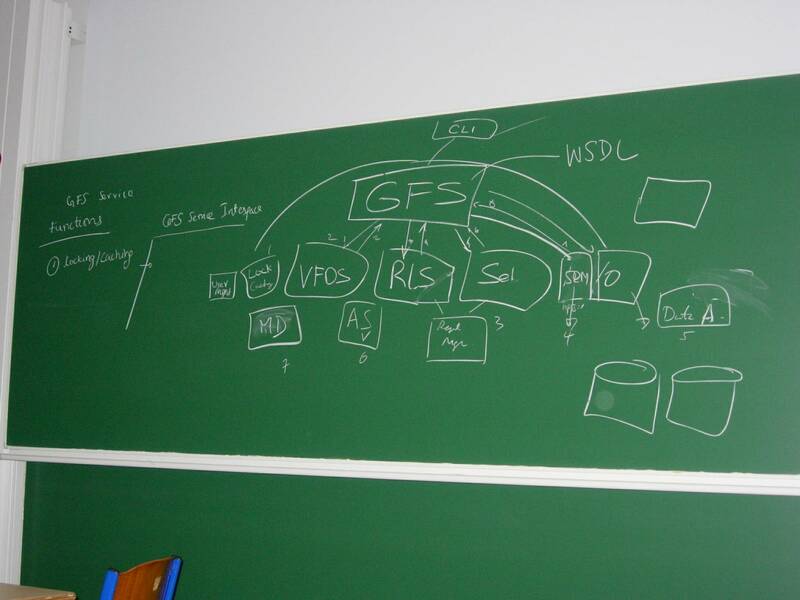 Grid Data Management Systems & Services Tutorial at 29th International Conference on Very Large Databases (VLDB 2003), September 11, 2003, Berlin, Germany. Co-lectured with Reagan Moore, Paul Watson and Norman W. Paton. Data Grid Services and Pipelines (Data Grid Language and Data Grid Pipelines) NPACI Summer Computing Institute, August 22, 2003, San Diego. ppt (1.19 MB).